mCloud Review 2019: Is mCloud a Good Hosting? mCloud is an affordable hosting provider offering advanced cloud hosting. There is a good uptime guarantee, along with many unlimited features in the plans. mCloud is a subsidiary of Mainstream, one of the leading Serbian website hosting providers. Founded in 2013, mCloud was setup to provide only advanced hosting services. The website is provided in Serbian, Slovenian, Croatian, and English. mCloud has servers located in three Tier III Serbian data centers, meaning that they have less than 1.6 hours of downtime per year. There is N + 1 redundancy on all components of the infrastructure and dual-powered equipment. All servers use SSD for far faster disk read speeds than traditional HDD. Even more importantly, there is a 99.99% availability guarantee, backed by compensation in a service level agreement. This is great news and actually pretty rare. One of the core services offered is cloud hosting. 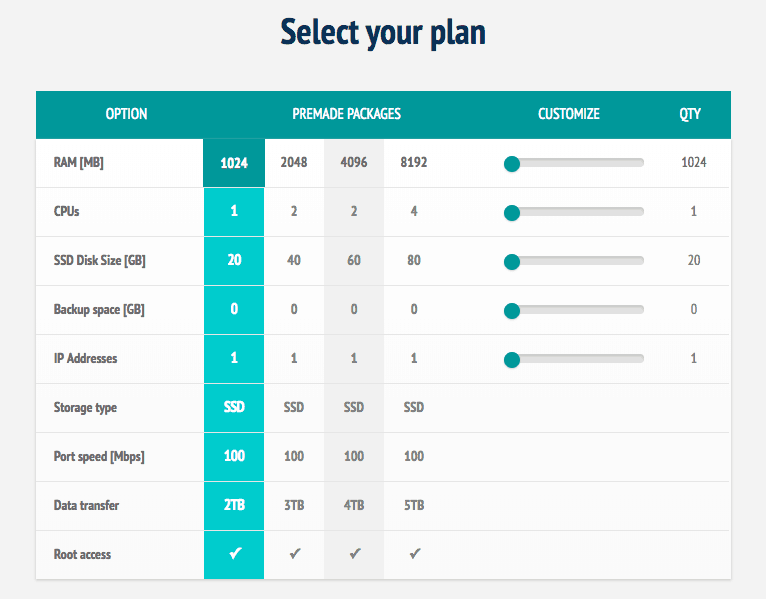 All of these plans are fairly comprehensive and have many unlimited resources e.g., unlimited domains, subdomains, bandwidth (with the usual caveat of normal usage), MySQL databases, and FTP accounts. While the resource quotas are high, the value added features are limited. You can choose between Windows or Linux for the operating system, and there is support for PHP (only version 5.3 – 5.6), as well. However, while the cloud hosting plans are good, what I was impressed by was the flexibility of the cloud servers. When you’re purchasing your server, using a sliding scale, you can add RAM (1024MB – 8192MB), CPUs (one – four), SSD storage space (20GB – 80GB), backup space (0GB – 500GB), and so on. It’s very easy to use, and unlike many enterprise level services like this, your cloud server will be setup instantaneously. There is a one-click configuration and you can update resources (CPU, RAM, Disk, Backup, DNS, security rules) easily from the control panel, and many applications come pre-installed such as WordPress, Joomla!, Drupal, cPanel, Magento, and so on. The prices are cheaper than other similar companies. While you do need to factor in the cost to purchase a domain and SSL certificate on top,the prices are still very good. The cloud hosting plans are purchased in one year terms, and the cloud servers are payable in one month terms. Support is available 24/7 and they are reachable by email or phone. Alternatively, if you’d like to research your issues yourself, there is a small knowledge base. There is a customer zone, which requires login, so potentially there could be additional resources available there. mCloud offers Serbian hosting with a 99.9% uptime guarantee and SSD storage. The features are limited, but the plans are affordable and very high in resources. Buy affordable cloud hosting now at mCloud! 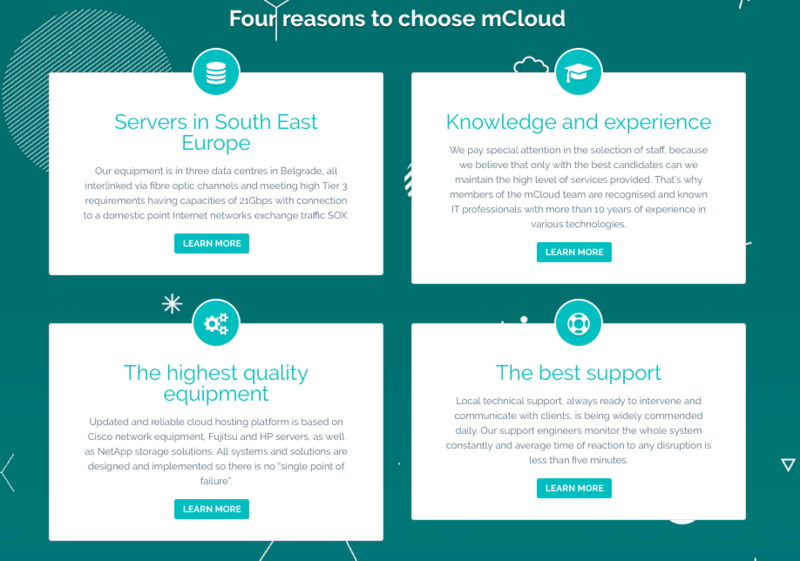 Wondering how mCloud stacks up against other Web Hosting companies? Enter any other Web Hosting company and we will give you a side-by-side comparison.